The Hinkley Point C nuclear power plant is already facing a £1.5bn cost over-run and potential delay of up to 15 months, the consortium behind the project has admitted. The announcement was made by EDF Energy following a review of costs and the timetable for completion - just a week after the Government's spending watchdog warned Hinkley would be "risky and expensive" for consumers. When the contract was signed, the cost of delivery was put at just over £18bn and it was scheduled to begin output in 2025. 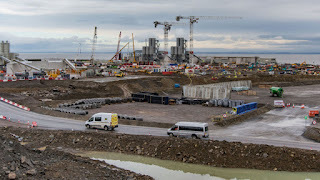 EDF, which owns two-thirds of the project with China's General Nuclear Power Group holding the rest, said completion costs were now estimated at £19.6bn when based on 2015 currency rates. It explained the extra money resulted mainly from a better understanding of the "design requirements of British regulators, the volume and sequencing of work on site and the gradual implementation of supplier contracts." As a result of the additional spending, EDF expected its rate of return to fall to 8.5% from 9%. The company added that there was a chance of £700m in further costs if construction fell behind. EDF said there was a current risk of over-runs of up to 15 months. The announcement was made three months after "good progress" was reported by EDF. It will embolden critics of the scheme who argue the plans for the twin reactor plant in Somerset are simply too complex and costly. The reactor design has run into huge problems, with cost overruns and delays at sites in France and Finland. The National Audit Office warned last week that payments set to be added to consumer bills have soared from an estimated £6bn to £30bn. John Sauven, executive director at Greenpeace UK, said: "Today's news is yet another damning indictment of the Government's agreement to go ahead with this project. "This year's school leavers will still be paying for Hinkley when they approach their pension age. And now it looks like they will be paying for the most expensive object on earth for even longer." Ministers argue it will provide 7% of the country's electricity needs over 60 years. A spokesperson for the department for Business, Energy and Industrial Strategy said in reaction to the cost review: "As the developer has made clear the project remains on track to meet its first major milestone in 2019. "The UK Government negotiated a competitive deal which protects consumers and ensures that all of the cost of construction, including any overruns, sits with the contractor. "Hinkley Point C will be the first new nuclear plant in a generation. This was an important strategic decision to ensure that nuclear is part of a diverse energy mix in the UK. Consumers won't pay a penny until Hinkley is built; it will provide clean, reliable electricity powering six million homes."